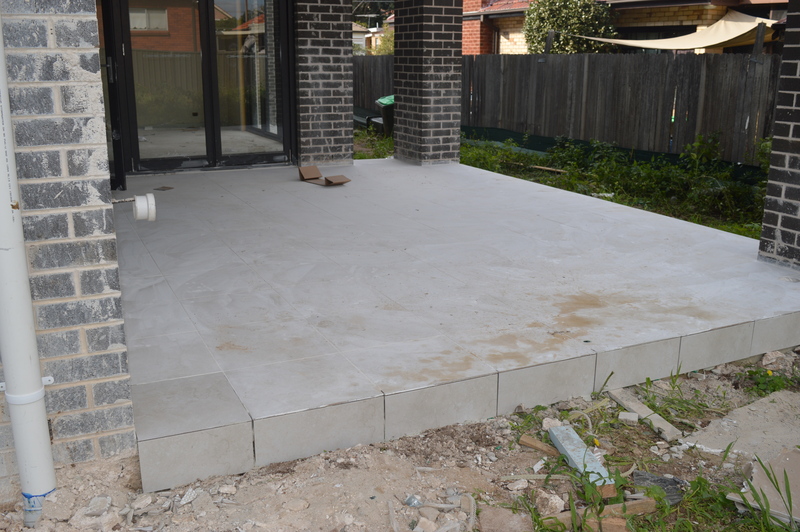 If you’ve ever renovated or built a house, you would know that the process requires a healthy dose of patience. 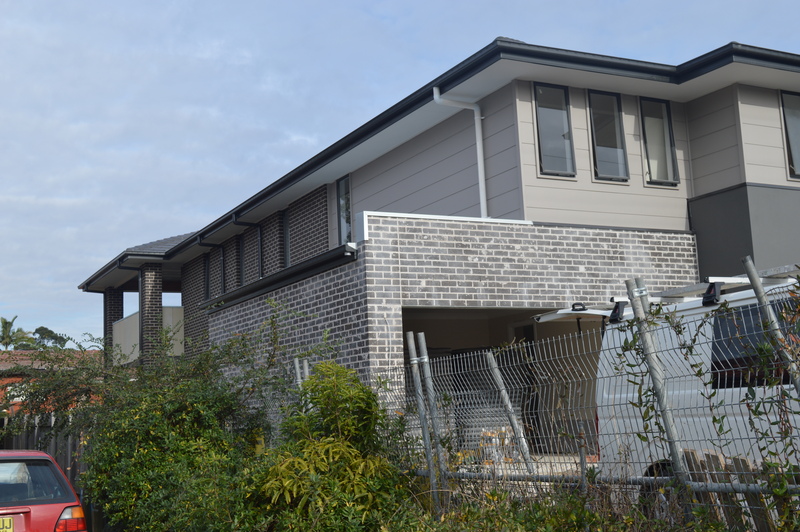 Today marks 450 days since we paid the initial deposit to Metricon and kick started this building journey. As we get closer to the end, it feels like the finish line is still so far away. 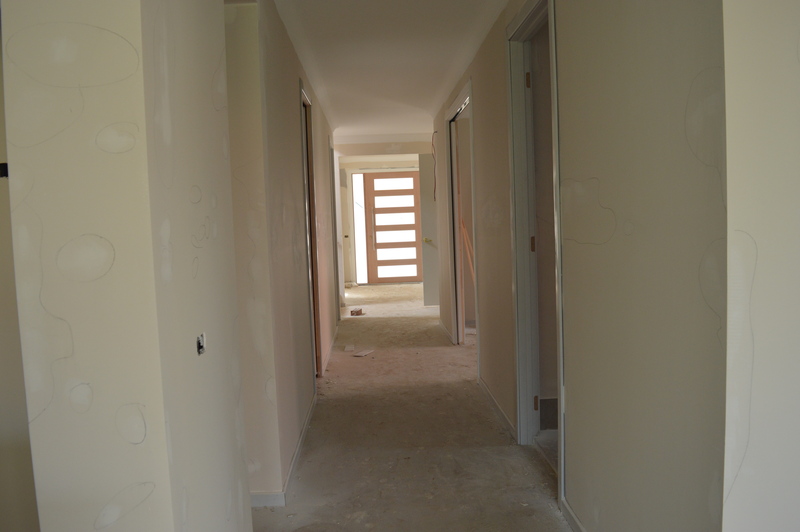 My weekly site visits are also becoming less exciting, as visually the transformations aren’t too obvious week to week. 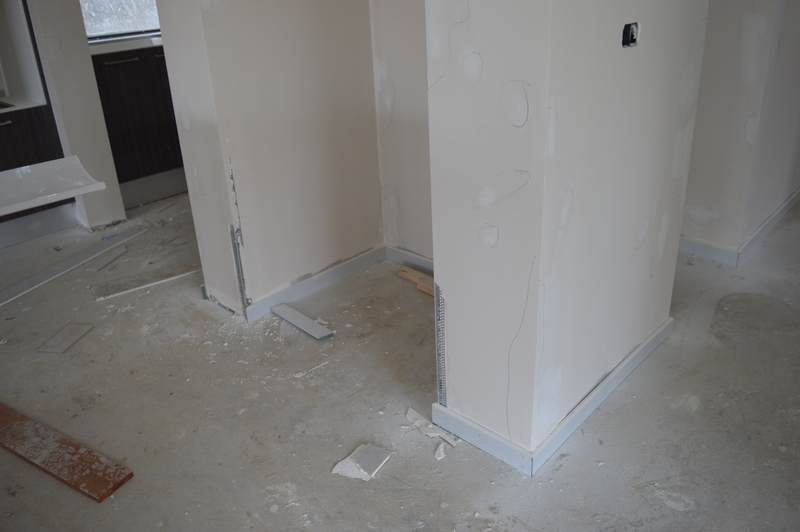 Gyprockers were on site on Friday and Saturday patching up. 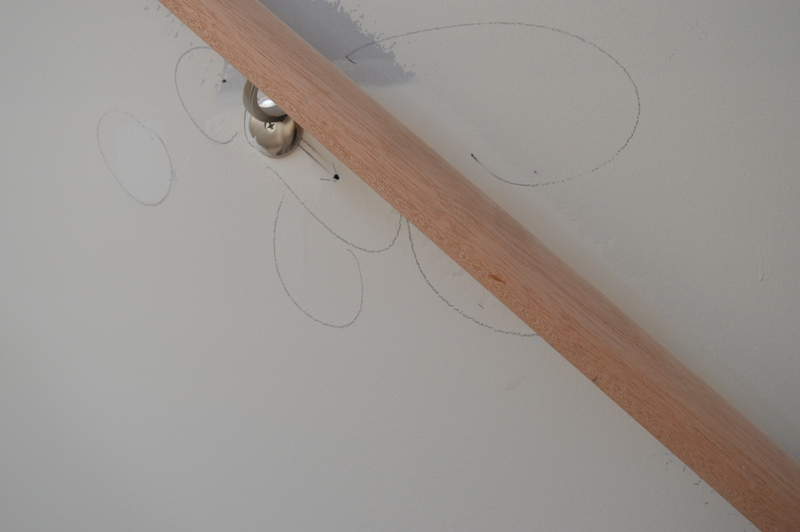 As the photos show, it looks like our awesome site manager JM has been through the whole house with a pencil and let loose! JM sent me an email to report the issue with the fridge space has been rectified. The cavity is now wide enough to fit our 908mm fridge. It would have been a disaster if we hadn’t picked up the issue before moving day! Phew! 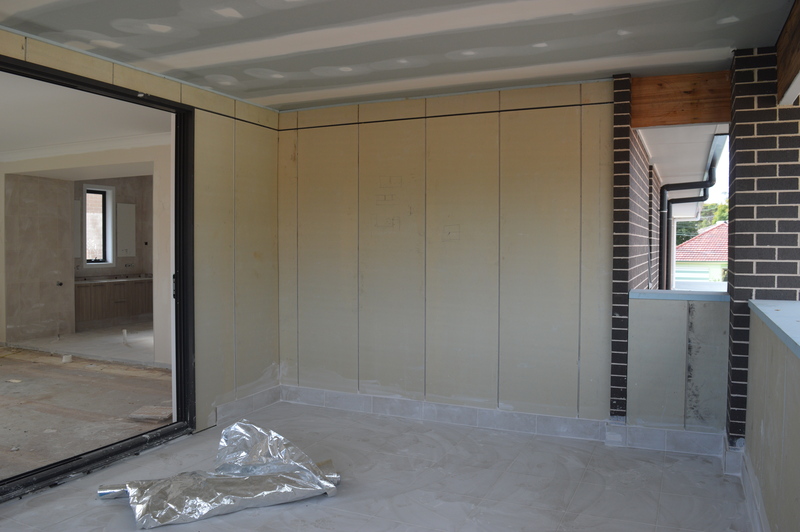 As we customised the kitchen through Castlewood, the bulkhead in the butlers pantry wasn’t drawn on the final plans. JM actually picked up this oversight and told me he would fix it without any prompting from me. JM called me whilst the shower screen supplier was on site measuring up. He had a question about the shower screen in the powder room downstairs. 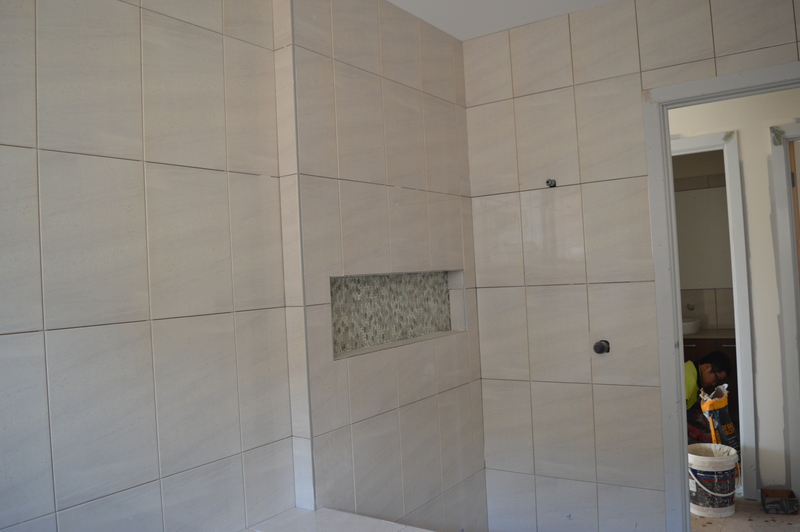 During the initial planning stage, we added a shower in the powder room. On the plans, it’s specified as only having a fixed glass panel with no door. I think a reasonable person would assume that when you ask for a shower, you will get a shower screen with a door. Silly us, we didn’t check the fine print and because we signed off on the plans we may now cop a variation if we want to add a door. Arrgh, never assume anything peeps! 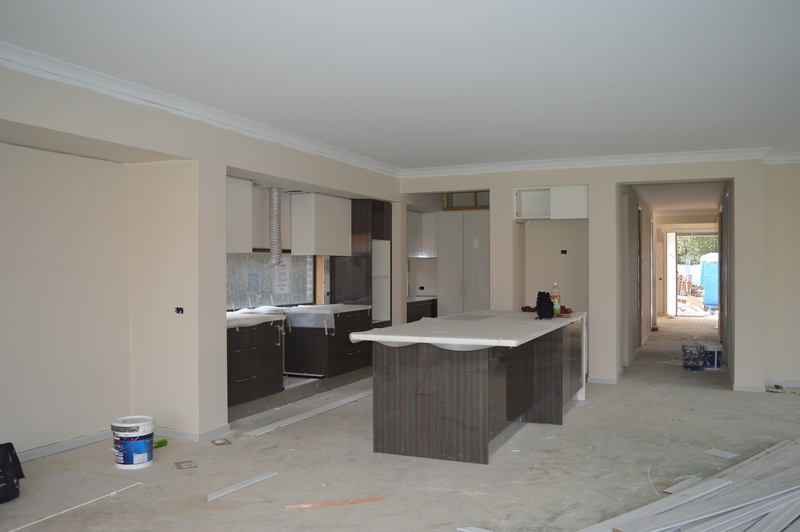 We had our hearts set on spotted gum floors for our house but we really didn’t like the standard way that Metricon install timber flooring with scotia. We begrudgingly paid the hefty variation of ‘no scotia’. 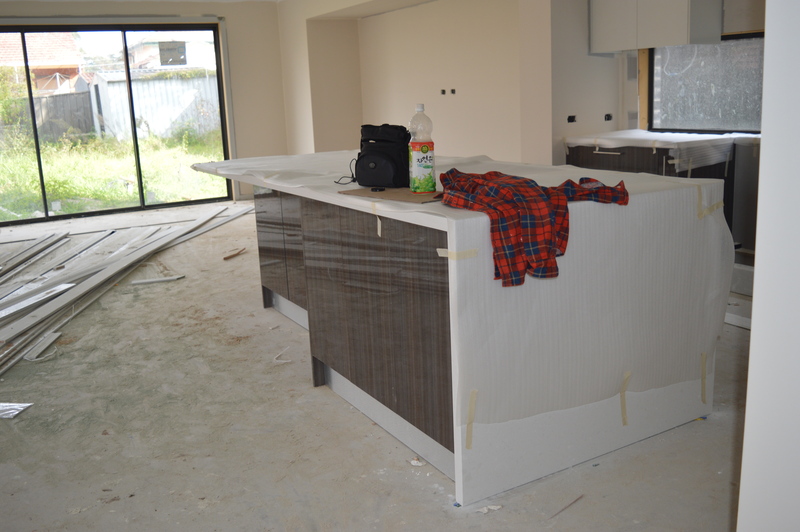 I’m starting to wonder how they will do the flooring around the waterfall edge of the island. I’ll be discussing this with JM when I see him on Wednesday. Hopefully he’s on top of it but with 18 builds on his plate, I won’t be surprised if he’s not aware of this variation. Better to give him the heads up ASAP so there’s no unpleasant surprise down the track. 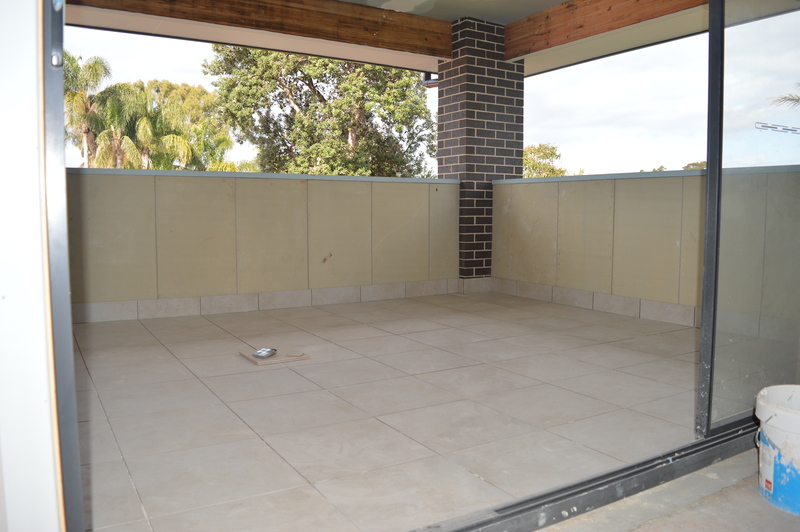 I’m so glad I managed to talk the building manager into letting us change the cladding in the master bedroom balcony. I love the contemporary look of the Matrix panels. 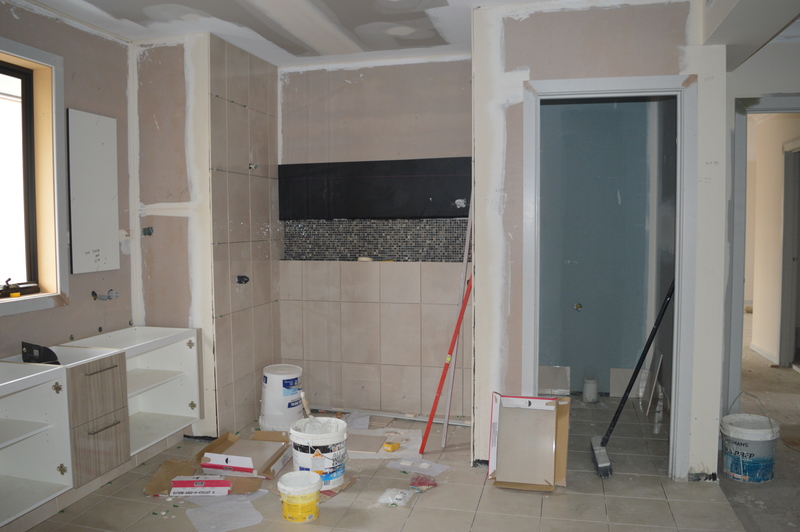 We didn’t get an update from the site manager last Friday so I just assumed that nothing much happened during the week apart from tiling. 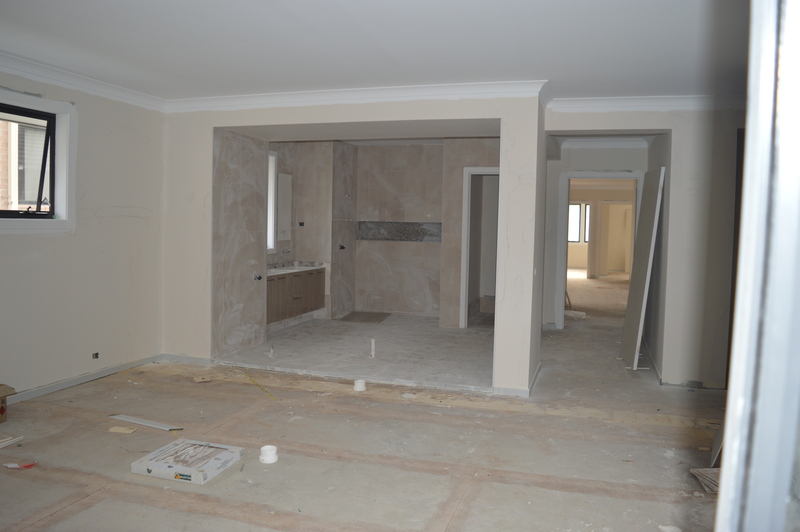 So when we drove by on Saturday, we were pleasantly surprised to see the stone benchtops and sinks had been installed and the first floor ceiling and walls had also been given an undercoat of paint! As an aside, it seems like our dream run to the finish line has come to an end. We picked up a few issues, one of which was the fridge cavity size. 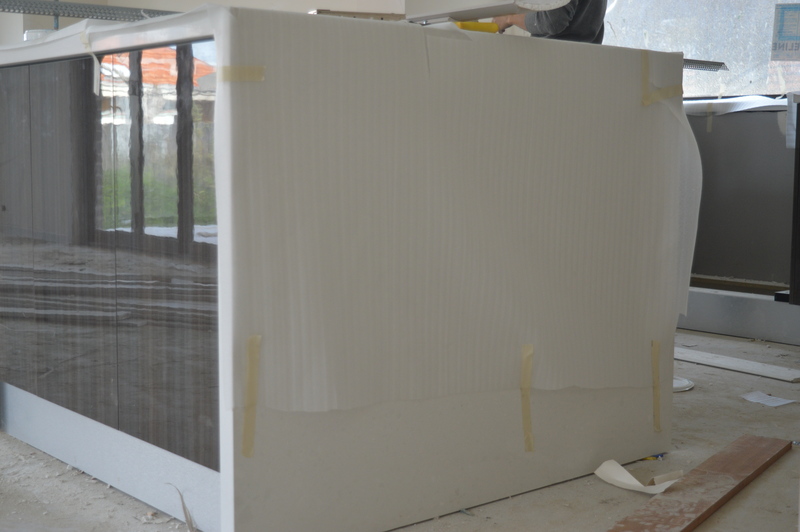 It’s marked on the plans as 980mm wide and during the design stage we flagged the importance of the width being sufficient to fit the fridge we had already bought. 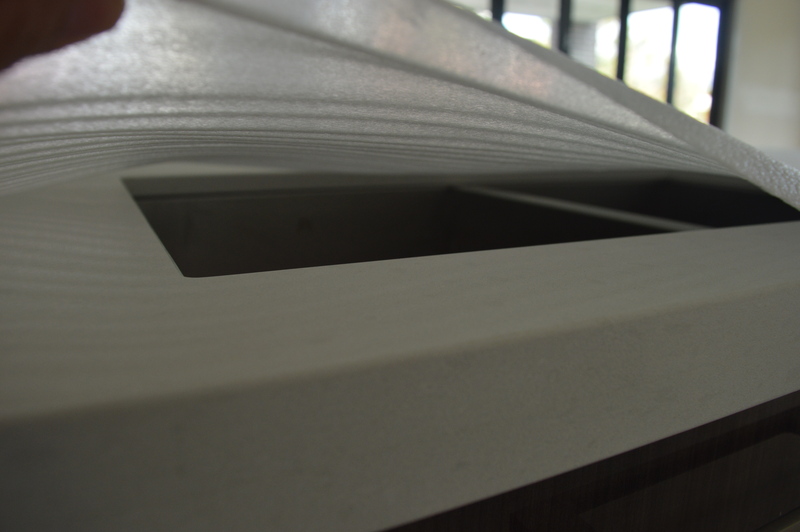 Our fridge is 908mm wide and the recommended clearance is 20mm each side for optimum air flow. 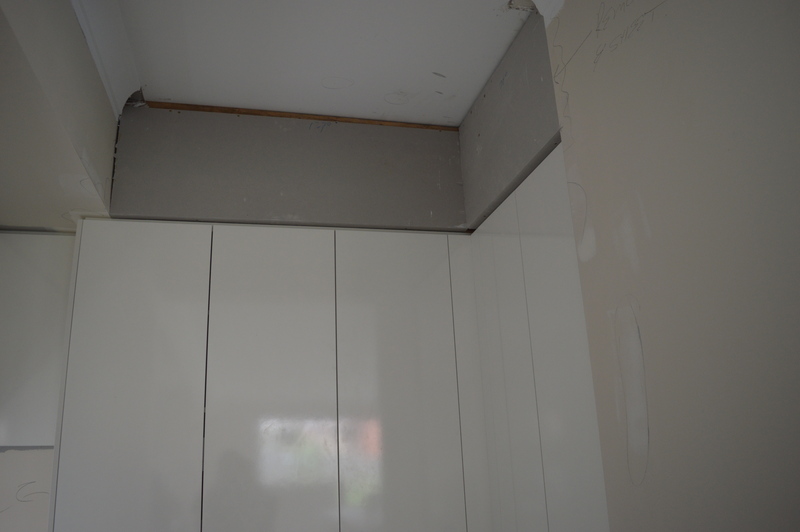 On paper, it seemed like there is sufficient clearance but it turned out that the dimension denoted on the plans was the frame size and with gyprock and skirting boards, the cavity size is now reduced to roughly 906mm! 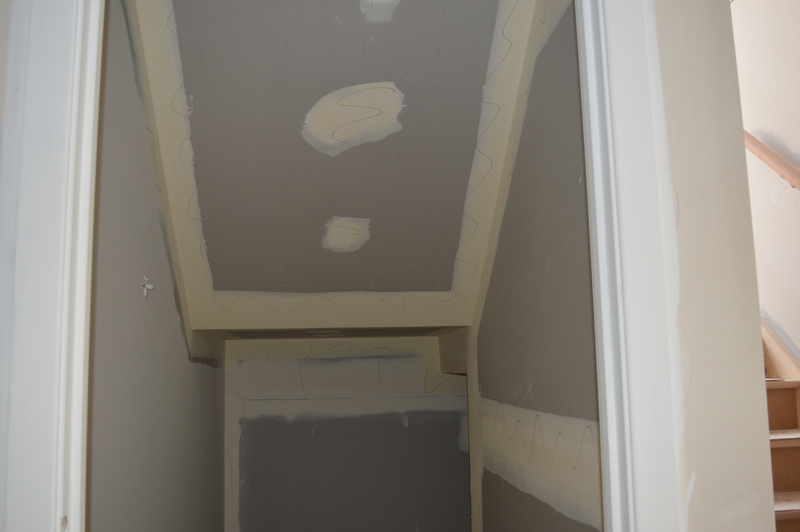 We consulted with our building inspector and they advised that the cavity wasn’t built to specifications and Metricon need to rectify. 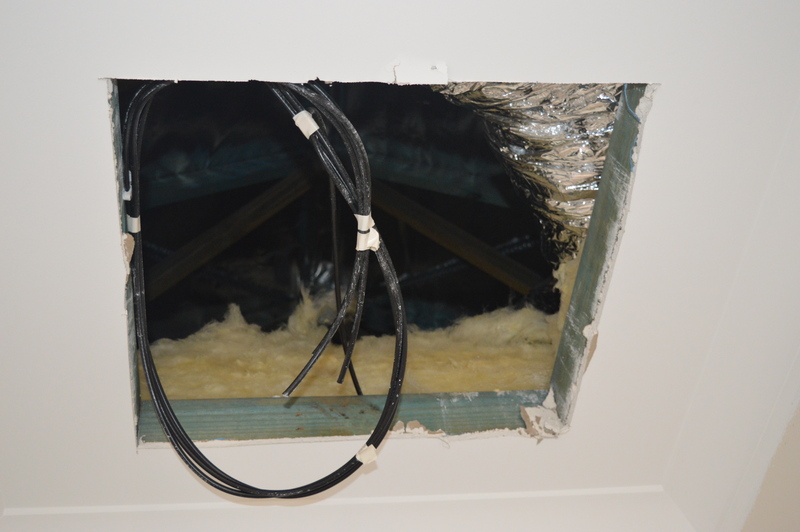 To his credit, site manager promised to look into the issue as soon as possible. Watch this space! 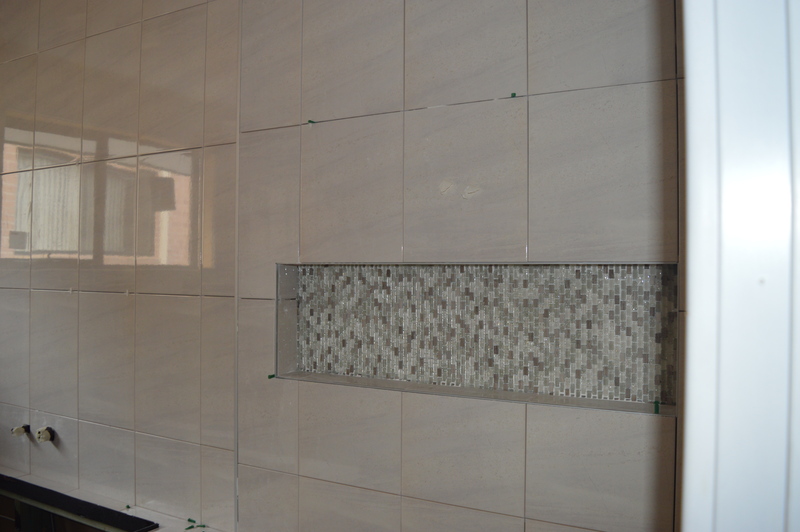 I love our tiling choices for the guest bathroom downstairs. 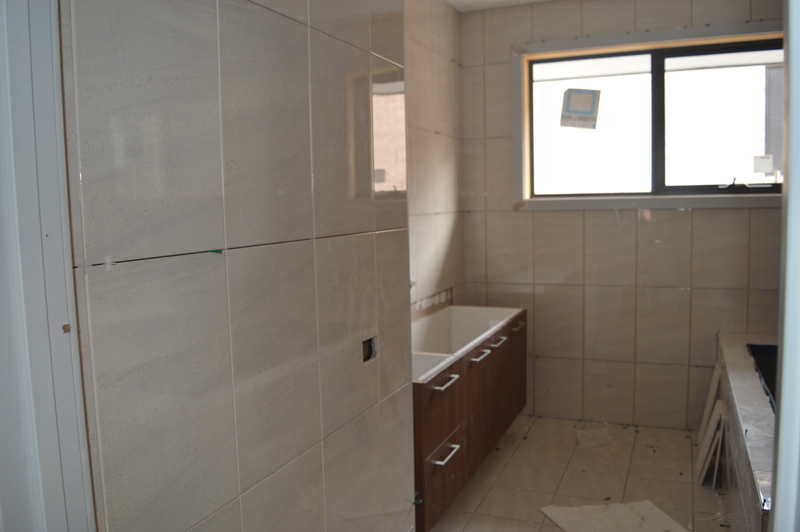 Can’t wait to see the finished room with the mirror and wall mixer. Love the white subway tiles in the laundry. My idea was to add more cupboards after handover but I’m now thinking we have ample storage in the house. So another option is to continue the subway tiling on that wall. 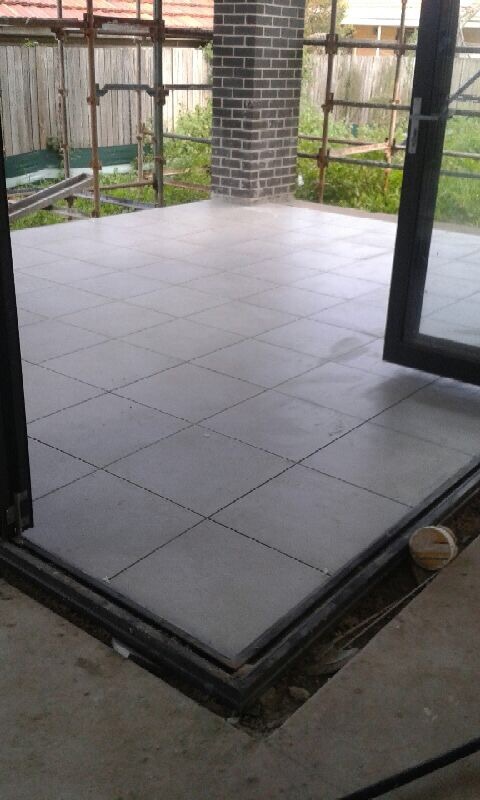 So happy with the alfresco tiles. They look fantastic with the dark bricks. 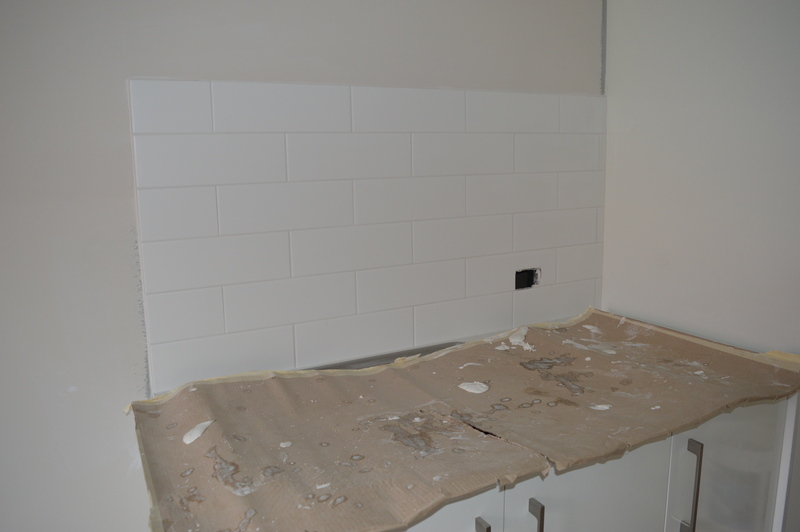 We’re not particularly happy about the tiling workmanship. When I dropped by last week, I didn’t stick around to scrutinize the work but thank goodness I took a lot of photos. 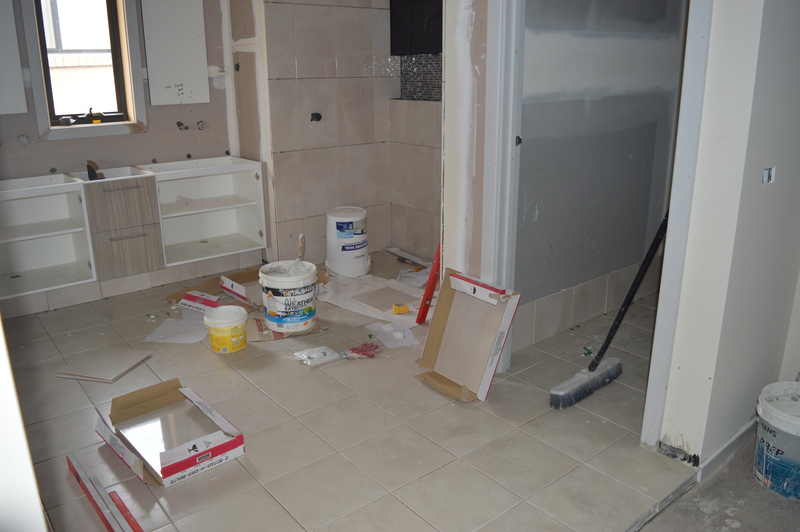 As I was flicking through, it became obvious that the laying of the wall and floor tiles especially in the ensuite was less than ideal. 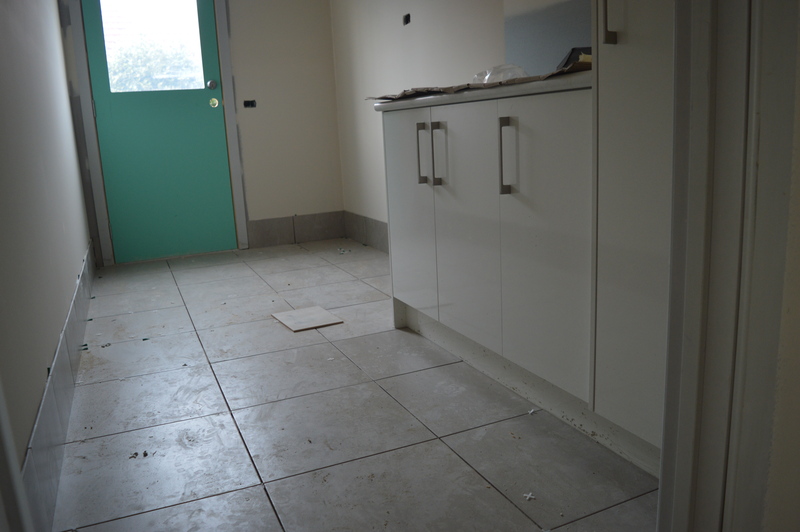 We were underwhelmed by the wall tiling not matching up to the floor tiling so we flagged our concerns to the site manager, who agreed to re-do the tiling. 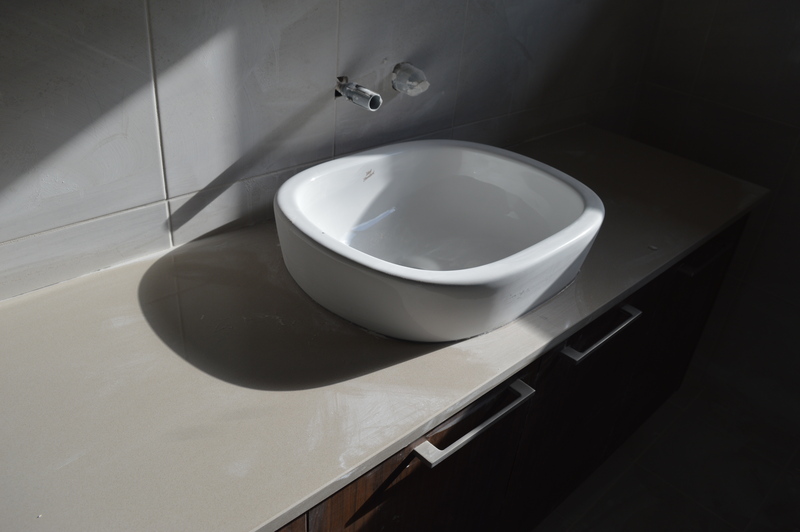 Well, it looked like the wall tiling under the vanity had been rectified to be in line with the floor tiles. 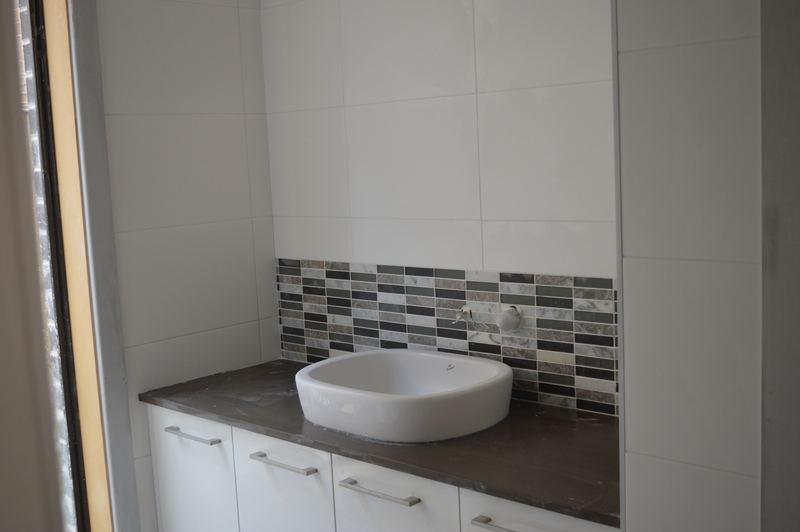 But what about the rest of the tiling above the vanity? Seriously, why only fix a section of the wall? 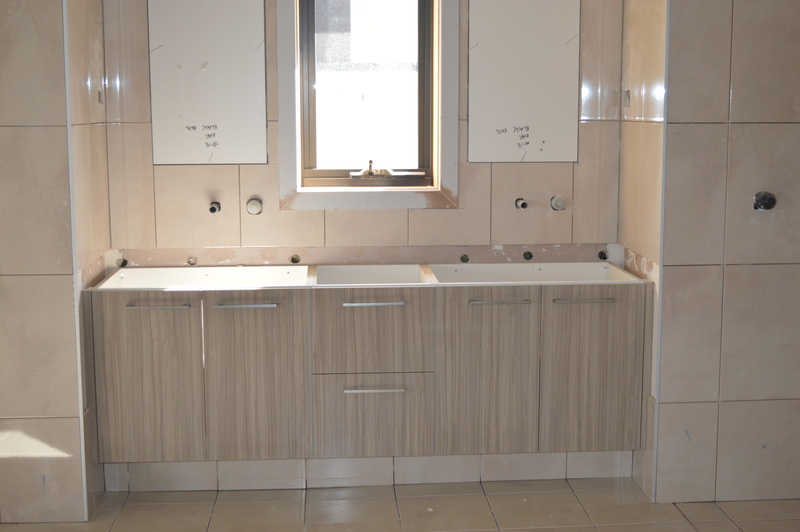 Did the tiler think we wouldn’t notice? Arrgh, not happy Jan! We are inching ever so close to the finish line! It feels unreal to be at this point after months of planning, designing and a lot of waiting. 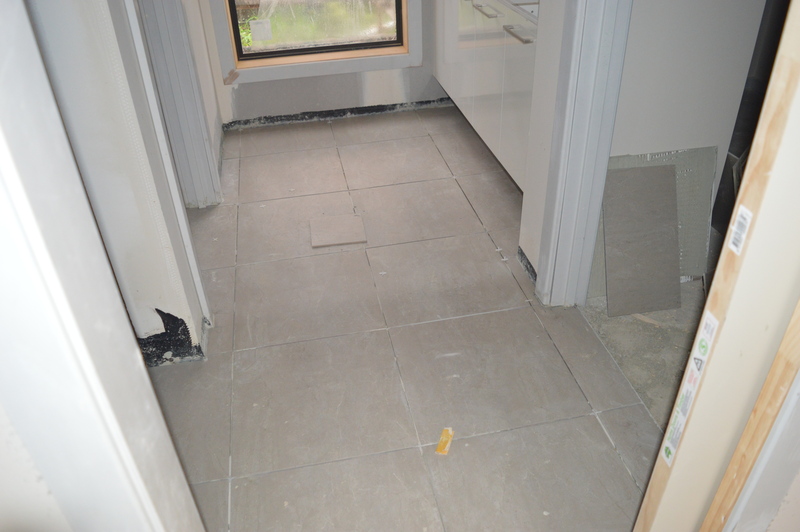 Our lone tiler is doing a good job. I reckon he’s completed roughly 60% of the house. 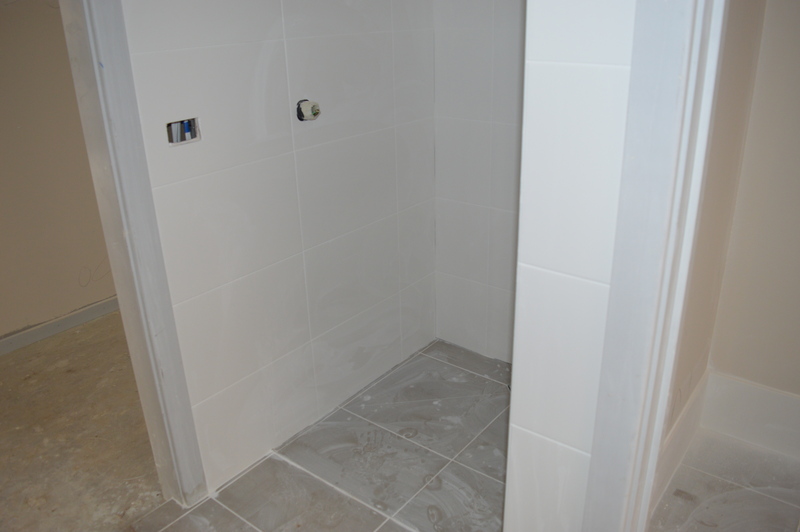 We didn’t splurge on tiles and most of our floor and wall tiles were from the Metricon’s standard range. I had my doubts but really happy with how our selections have come up.